Amidst friends and fans tonight, DEEP Women’s Lightweight (106-Pound) Champion Miku “Supernova” Matsumoto officially retired at DEEP: “44th Impact” in Japan. Matsumoto engaged in an exhibition match with close friend Megumi “Mega Megu” Fujii prior to a lengthy retirement ceremony celebrating Matsumoto’s career. Matsumoto and Fujii competed in a surprisingly active exhibition fight for over four minutes before Fujii, with a smile on her face, held her arm out and allowed Matsumoto to end the match with a flying armbar. Prior to the match, a lengthy promo video featuring highlights of Matsumoto’s career was shown. Matsumoto stated in an interview portion of the video that she may have continued her career if female fighters had a major promotion to compete for such as DREAM. At the conclusion of the video, Matsumoto and Fujii made their way to the ring and proceeded to engage in a relatively realistic fight with some legitimate punches thrown by both fighters. With just under 30 seconds left in the five-minute exhibition bout, Fujii extended her arm and, with that, Matsumoto finished her career with a sentimental victory over her good friend. Following the bout, reporters and friends of Matsumoto showered her with flowers and gifts and she was presented with her DEEP title. In addition, fellow fighters also entered the ring to thank Matsumoto. 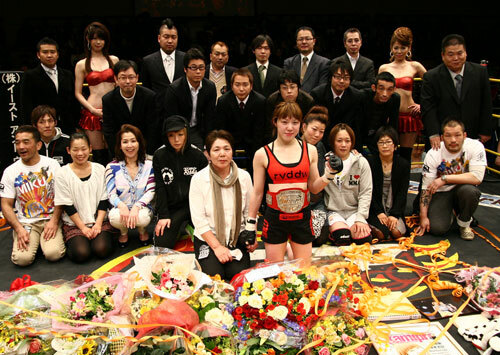 Among those paying their respects to Matsumoto’s career were DEEP Women’s Flyweight (99-Pound) Champion “Princess” Satoko Shinashi (pictured above; front row, third from left), former DEEP Women’s Lightweight Champion Hisae Watanabe (front row, fourth from left), veteran striker “Windy” Tomomi Sunaba (front row, fourth from right) and Fujii herself (front row, third from right). Matsumoto posed for photos before giving an emotional farewell speech. 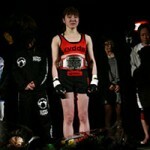 At the time of her retirement, Matsumoto is presently ranked at number two in the women’s flyweight division and number three in the MMARising.com Women’s Pound-For-Pound MMA Rankings. She leaves the sport at the pinnacle of her career and will be sorely missed as mixed martial arts in Japan continues to struggle. In honour of Matsumoto’s illustrious career, the following videos cover her biggest victory when she defeated Hisae Watanabe to capture the DEEP Women’s Lightweight Championship at DEEP: “31st Impact” on August 5, 2007. An exclusive English interview with Miku Matsumoto can be found here. MMARising.com wishes Miku the best in her future outside of MMA. is their a video of the match? I haven’t seen one posted yet, but the event was televised in Japan and videos usually start popping up on YouTube in the week or two afterwards. Keep an eye out.